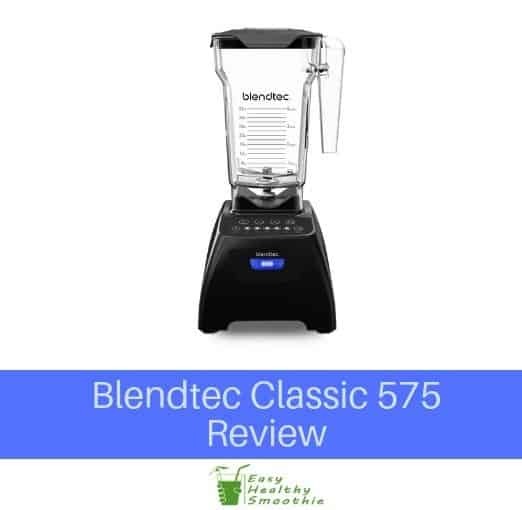 If you need a large blender that can make smoothies to last for the entire day, the Blendtec Classic 575 might be a good option for you to look into. This is a big blender, one with reliable functions, it’s easy to use, and can handle pretty much any ingredients out there. It might be a bit pricey, but if you are serious about smoothies, it is well worth the investment. It looks powerful and the 4 sided design is interesting. It does take up a lot of space though. Standard pre-programmed cycles for smoothies and cleaning and a pulse function with 5 incremental speed settings. The controls are self-explanatory and the jar is designed to pull ingredients towards the blade making this a very effective smoothie maker. It is made from quality materials and should work without issues for years. Overall a versatile, commercial grade, high quality blender that is ideal to make smoothies for the whole family! If you like mixing up smoothies and protein powder drinks, the Blendtec Classic 575 might be a good option for you. It’s one of those blenders that works really well at what it was designed to do. Coming in with a 44-ounce blending capacity, its size makes it ideal for blending up some fairly large quantities of ingredients at the same time. In other words, it’s a good option to go with if you need to mix up a lot of smoothies to be drank throughout the day, or if you have guests over. Now, this is definitely not the cheapest blender around, quite expensive in fact, so it’s not something that you should buy if you are just going to be using it as a novelty every week or two. Its price does translate to a high-quality design and lots of functionality. But it also means that you need to use it on a daily basis to get your money’s worth. This is a high-priced and high-quality blender that is best for people who are really serious about making a variety of smoothies day in and day out. When you buy the Blendtec Classic 575, you of course get the blender itself, which is a very nice purchase. Here you also get an easy-clean jar, which is great as you can take advantage of the self-cleaning mode. The jar is designed to make ingredients move towards the blade, plus it also comes with a lid that will stop messes from seeping out. This item also comes with a specialized spoon spatula for scraping things out of the jar once blended. Of course, it also comes with the power cord and everything else that you need to get going. The Blendtec Classic 575 does have a few neat features that are worth mentioning no doubt. For one, it does have a huge capacity. The cup itself can technically hold 96 ounces, with 44 ounces of blending capacity, which means that you can make big batches. In terms of blending without much effort, this blender comes with a variety of pre-programmed settings. You can choose from the smoothie, 60 second, 90 second, and self-cleaning modes, just to name a few. Of course, the smoothie mode is great for making all of your favorite smoothies, but the setting we like the most is probably the self-cleaning mode. If nothing else, this mode is just very convenient and it eliminates the need for a big cleanup job at the end. The Blendtec Classic 575 also features 5 incremental speeds that you can choose from, plus a manual pulse mode as well. It’s definitely quite a versatile blender to keep in mind. What is really neat here is the LCD display that is super easy to read and navigate, plus the timer function so you can get consistent results every time. Perhaps the very best feature here is that the jar itself is made with 4 sides. This special design helps to pull ingredients towards the blades instead of away from them, as tends to happen with other blenders; it makes for quick and efficient blending all day long. Speaking of the blades, they are very sharp and durable, so be careful when cleaning. If you need a high-capacity, efficient, and fast-acting blender for all of your smoothie making needs, the Blendtec Classic 575 is a pretty nice option to go with, albeit an expensive one. It might be a bit loud, and yes, quite pricey too, but it does work well for all kinds of ingredients out there.